As I’ve mentioned in previous writings for CD of the Month Club selections involving Front Range musicians, we are very fortunate to have so many marvelous musicians and excellent educators living among us. One of our brightest and most talented fixtures on the scene is not only a native son of the Mile High City of Denver but also a brilliant saxophonist and highly esteemed instructor, Keith Oxman. It is customary for KUVO Jazz to select a home grown recording to kick off every year’s choices for our CD of the Month Club members, that said it was a no-brainer to pick Keith Oxman’s Glimpses album that teams him with NEA Jazz Master and fellow reed man, Dave Liebman, another superb outing for Keith for his home label of Capri Records of Bailey, CO for which he has recorded over 10 swingin’ albums often with all-star guests like Dave, Curtis Fuller, Joe Bonner, Chip White, and the finest Denver based musicians. Not only does Oxman bring in jazz masters to record with, but he has also shared stages with many legends of jazz including Buddy Rich, Sonny Stitt, Art Blakey, Mel Tormé and others. Keith was part of the house band during the glory days of El Chapultepec which enabled him to play with a long line of guests that would go jam at the ‘Pec after their gigs in the Denver area, for instance, Wynton Marsalis, Eddie Harris, and Red Holloway just to name three. As an educator. Mr. Oxman is beloved by his students who remain close to him long after graduating. His student bands always play with the passion he instills in them, KUVO Jazz always looks forward to his ensemble playing yearly at our Phyllis A. Greer Performance Studio. 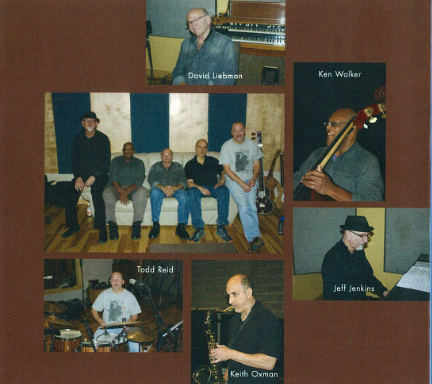 After getting Dave Liebman to visit as a guest instructor at East High School in 2017, Keith recruited Liebman to record with him for seven of the 8 tracks on Glimpses, a song written by the NEA Jazz Master David Liebman. Four of the other selections come from the pen of Keith Oxman with three cover songs. Joining Dave on soprano/tenor saxes and Keith on his habitual tenor sax are Jeff Jenkins-piano, Ken Walker-bass and Todd Reid-drums who also is responsible for the cover art work of Glimpses along with the design, photography, and layout. Duke Ellington’s In a Sentimental Mood becomes a showcase for Liebman as Keith lays out to allow Dave to be the sole saxophonist, turnabout is fair play as Liebman doesn’t play on the moving standard of yesteryear rarely performed anymore, I Sold My Heart to the Junkman. Besides the title track of Glimpses, two of my personal highlights are Keith Oxman’s Trane’s Pal and Cedar Walton’s Afreaka. This recording is one of those that warrant repeated listening as every time you listen you will hear a nuance, a riff, or a quote that perhaps you missed previously. As always, Keith Oxman delivers a powerful musical punch, in fact, he has given us another K O recording! Interested in becoming a KUVO CD of the Month member? Click here to join!